Deep in the underearth of Flannessia lies the ruins of the city of Khaz Caleigh. Unlike many other Dwarven cities that span this vast region of the Ered Ethlu'n mountains, Khaz Caleigh fell not to some unearthed horror, or dark sorcery, nor even to internal struggles, greed, or political in-fighting so common amongst Flannessia's Dwarven city-states. Khaz Caleigh fell simply to a game of Steiss. Well...Chess. After eons of cold, but mutually self-serving relationships with the Dark Elves of the region, relations had grown to such a mild degree that the King of Khaz Caleigh had established occasional communications and emmisaries from the Dark elven kingdoms of the Flannessian Underearth region. 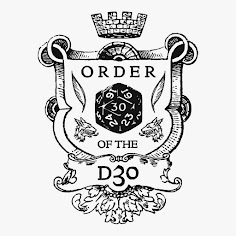 It was on such an occasion that the Dwarven King Durndwallin the Third, hosted the Lord ruler of the nearby Dark-Elven city-state of Zenrothrawn, ruled by the leading house council of Alezurn. Lord Alezurn, like all Dark Elves was well versed in the game of Steiss, similar to what we in our world, would refer to as Chess. Steiss was played by great rulers since time immemorial, and carried with it such weight and pride that entire kingdoms had been won and loss, entire populations destroyed, and if you were playing with the Orken lords of the northern Drythenblue steppe's, eaten, over single games. 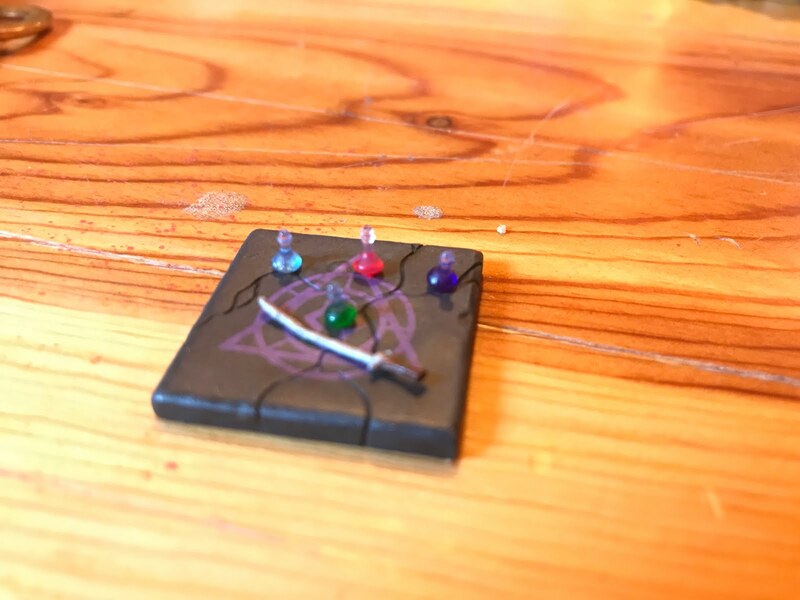 It was believed that with the movement of the individual pieces, came an arcane magic unfurled, bringing into formation the very fates of the Gods, thus deal in life what is dealt in Steiss as the saying went. Late into the night, Durndwallin battled against Alezurn, while their small retinue's of soldiers watched on in silent distrust, hands never straying from weapon hilts, each ready to pounce at a moments notice and bring death upon their sworn blood enemy, despite the recent warming of relations amongst the two kingdoms. Much Dwarven ale was consumed, and the Dark Elven wine made of the Deathcap mushroom had long been exhausted. And it was in this frustrated, angered, and silent haze of the early morning hours, when their watchful guards had all but slipped beneath the veil of sleep, that the two Kings battle on the carved wooden battlefield of Steiss came to an abrupt, and quite tragic end. Now, some say that his hand merely slipped in a drunken stupor, others say it was a failed attempt at a subtle cheat to end the hours upon hours of politically infused gaming, but either way, the slip of Durndwallin's wrist which moved his piece ever so slightly, so infuriated Alezurn, that without stopping, Alezurn immediately drew his dagger, and with the speed only the Dark Elve's possess, sliced Durndwallin's hand completely from his wrist in one violent arc. Blood splattered over the board as Durndwallin screamed in anger and agony at once, immediately arousing his guards who, with axes and swords and spears drawn, charged into a rage. Alezurn did the same, leaping over the table and thrusting his dagger deeply into the throat of the Dwarven King, relishing in the carnage and slaughter as he drove the wicked Drow blade deeper and deeper, nearly removing Durndwallin's head in a fit of slaughter. Amidst the chaos, the Dark Elves scrambled, their blades acrobatically finding their mark as they relished in the melee. Ultimately, the Dwarves of Durndwallin prevailed, destroying all in the small Elven retinue but Alezurn himself, who fled the city by dark ways. And upon returning to his own Kingdom, the Dark Elves waged a war as of yet unheard of in Flannessia's Underearth. 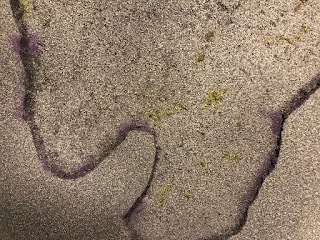 Their armies assembled, and with them, their scores of massive Purple Worms; ridden and driven forth by the Alezurn's armies; slaughtering and feeding and dissolving with their great acidic-blood all that lay before them. even soul in the great city state was destroyed, and not one slave was taken. So great and terrible was the utter destruction that it is said the final Dwarven head was severed after nearly two full weeks of siege. So great was the slaughter that even the very walls of Khaz Caleigh can still be seen marked by the dissolving acid of the great worm beasts. 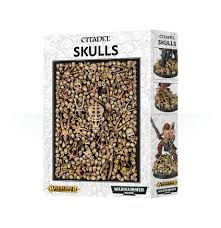 The few remains not devoured entirely or slaughtered and eaten, lay scattered throughout the vast city in barely recognizable clumps of fading bone and pock-marked acid split skulls. To go there now is to witness what might have been, to see what two races may have had, and the greatness that was once the architectural craft of the Dwarves, now lost to the ages. It's violent end only visible in tiny clues strewn about crumbling halls. The ruins are made from standard 'pink' insulation foam, found in board sheets as small as 2' x 2' at any local hardware supply store or home improvement chain. The Woodland Scenics brand foam cutter and a Styro-Cutter Plus foam craft tool. The Styro Cutter allows smaller details, edging, and carving runes and glyphs, although even this can be tough to get too fine of details with. This also works well for holes, cracked edges, and small cuts and scrapes. 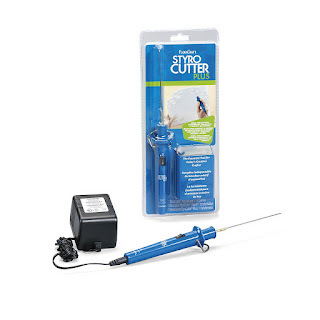 The main foam cutting tool utilized to gather larger pieces, stone bases, long edges, or more natural cut-stone slabs is the Woodland Scenics brand foam cutter. This has a long hot wire that allows larger more even cuts and works well for creating a more liner stone slab look or long straighter edges like the columns and archway edges of the gateway entrance made here on Khaz Caleigh. Once the foam was cut and styled, the glueing process began. I used standard PVA (Elmers brand Glue-All) and pressed the pieces with clamps and weights, allowing them to sit for almost a full 24 hours overnight. Once they felt solid enough to handle and move around, I moved on to the priming stage, which was done entirely by hand to achieve a more dabbled and rough stone-texture look. I typically use stone-texture spray paint, but the aerosol dissolves foam, so a hand application needed to be applied here. This actually worked even better, as it allowed me to get the basic gray craft paint into the cracks and crevices of the runes and knot work carvings of the outer wall. Because the foam starts as a pink color, it shows up quite well where you miss, so getting the bristles into the cracks is imperative, and also makes ensuring the glue is solid and completely dried crucial as well as the foam will be taking a bit of abuse and movement to capture the dabbed stone finish. 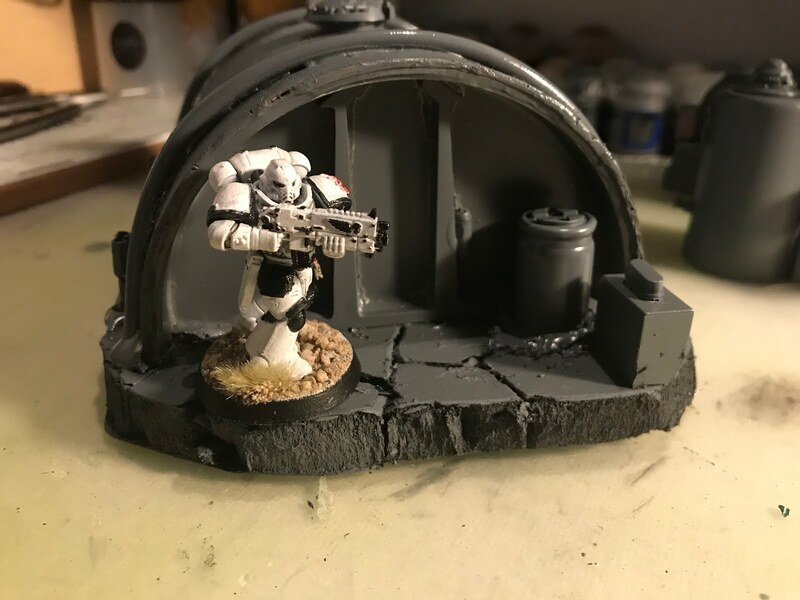 Once three layers of shaded gray were added in different depths and textures to give the look of stone, and highlighting with a soft white-gray on the dry-brushed stone edges was complete, I added a bit of random sand to the edges. This gave the look of gathered dust, waste, garbage, and general dirt, and aged uncleanliness. 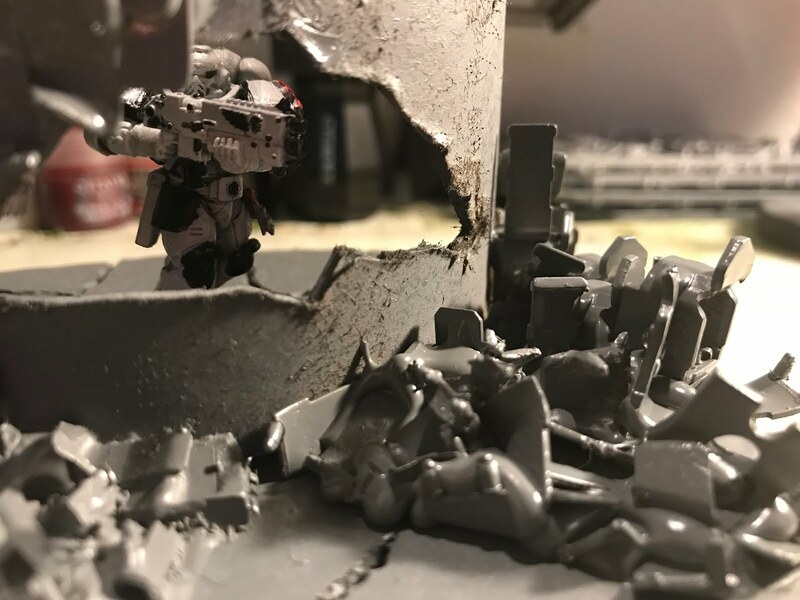 Lastly, Ia dded a few randomly placed skulls from the Games Workshop Skulls scenery pack to the edges as subtle hints and clues about the violent and gruesome history of this dreadful place. 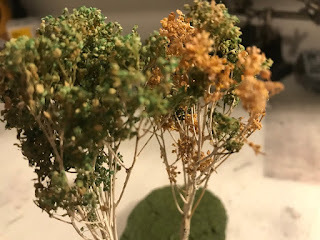 The finished look is perfect for a Lord of the Rings style Moria stand off, a D&D Faerun Underdark or Flannessian Underearth campaign, or even if filled with foliage and trees, a crumbling forest ruin. Modular, multiple uses and locations, and fun to build. Dungeons & Dragons Tomb of Annihilation Tomb and Traps set! 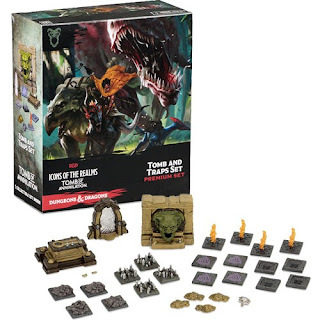 I'm delving more into formal reviews of my beloved Wizards of the Coast Dungeons & Dragons miniatures and products here on creative Dungeoneering, and wanted to start with a recent acquisition to the collection, the Tomb of Annihilation Tomb and Traps set. 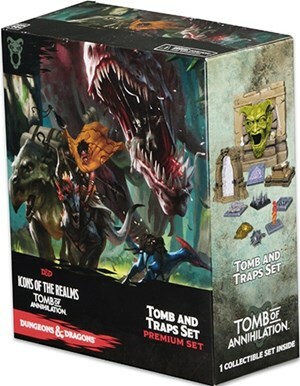 Being a big fan of the original Advanced Dungeons & Dragons module S1, Tomb of Horrors, and having never delved into Tomb of Annihilation yet, this set by Wizards of the Coast held much more nostalgic value. 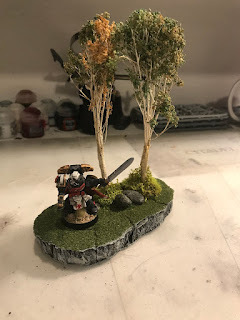 But one thing I love in miniature form is terrain....lots and lots of terrain! 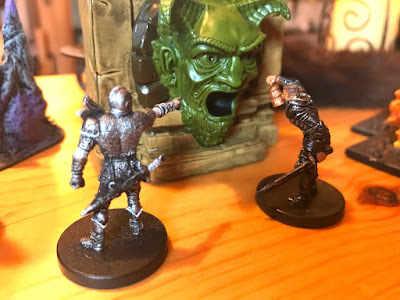 From it's old-school gaming artwork to the famous "Demon Mouth" of Acererak's tomb, The Tomb of Horrors is an iconic Dungeon I have always dreamed of replicating on my own table. The box set can be purchased from various online and retail outlets, but we're fans of supporting the folks over at Miniature Market where this set can be purchased for $65 US. 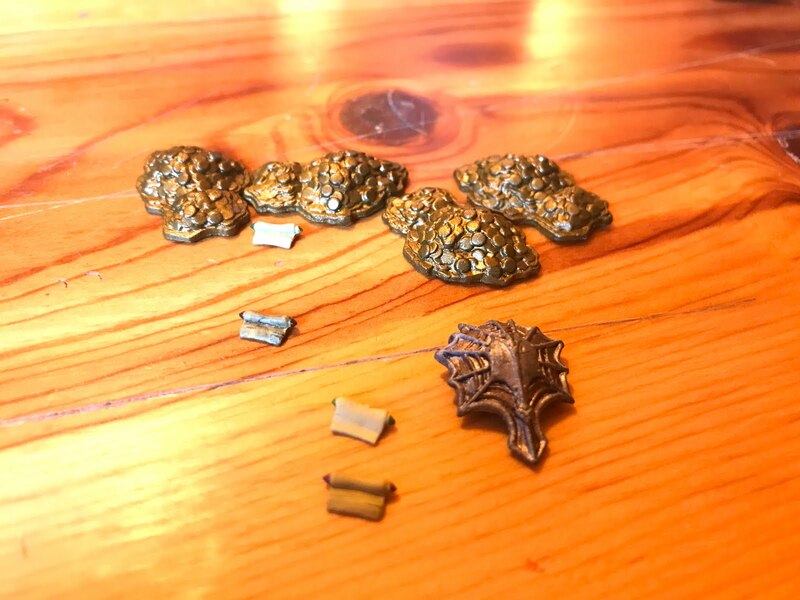 The sculpts on the various pieces are surprisingly well done, and with a bit of time and just a small amount of extra work (if even needed) they could be brought up to an even greater level of detail. The sheer variety available for using these for various dungeons and tombs is hard to imagine, with everything from blade traps, spike pits, flame spouts, and even small rubble and gold piles to add flavor to any dungeon or table top terrain outside of this specific game. All the pieces are of a strong, well-made plastic poly carbonate finish with a strong durability. I was impressed by the seams and welds of the plastic on the little details too; things like the way the reflective surface of the portal is set into the frame of the doorway, the solid fixture of the flame spouts into the tile, and even the details and durability of the carved demon face. 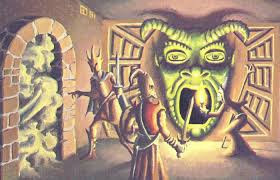 The crowning piece for me personally is of course the Demon mouth, set into a stone finished wall. the finish is good, albeit maybe just a tiny bit too shiny for being an old dusty tomb statue. This is the icon of the Tomb of Horrors, and without giving too much detail away, has created far too many TPK's (total party kills) throughout the history of this module! 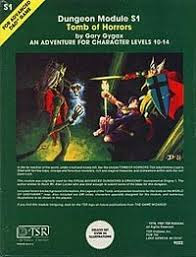 Great fun, and an icon of vintage dungeon crawl role-playing. 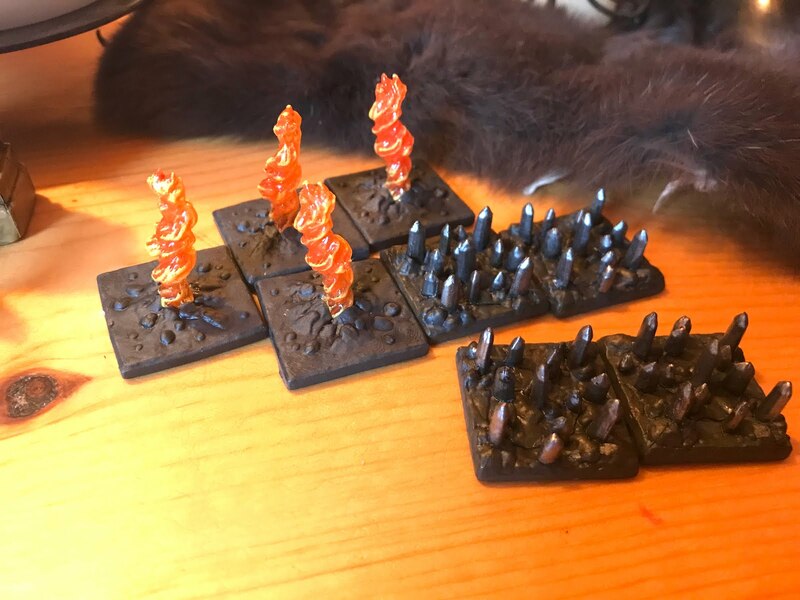 The 4 flame spouts and 4 blade trap tiles are well made and will be great fun, to use in multiple dungeons and settings as well. Finish is good on both, but a bit glossy on the spikes/stalagmites/blades of the spike tiles. Seeing these in a dark, tomb-like setting however makes more sense, and I've grown to actually like the slightly black gloss finish. 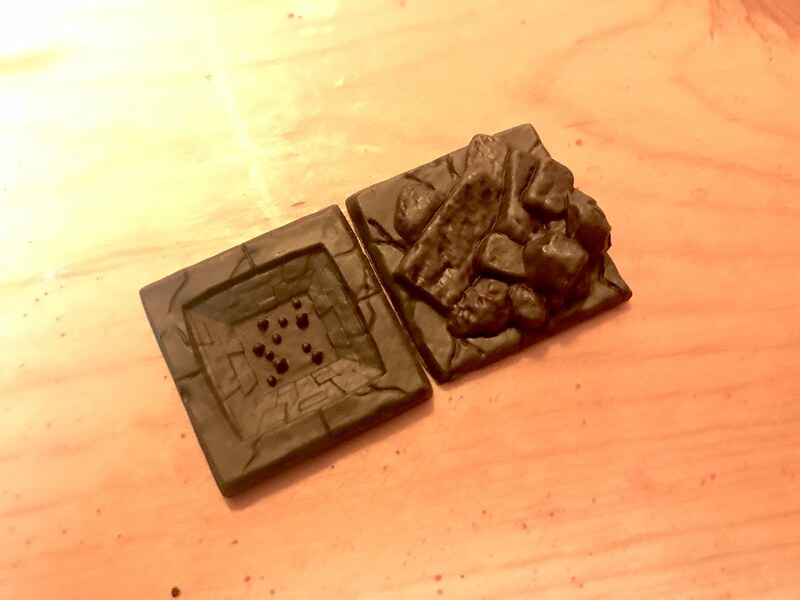 The spike pit tile and boulder pile tile were somewhat less impressive, and in need of a bit of dry-brushing or additive coloring to bring out the highlights and depth. I love what Wizards has done with the "depth" on the spike pit, but the flat matte coloring makes it tough to see. 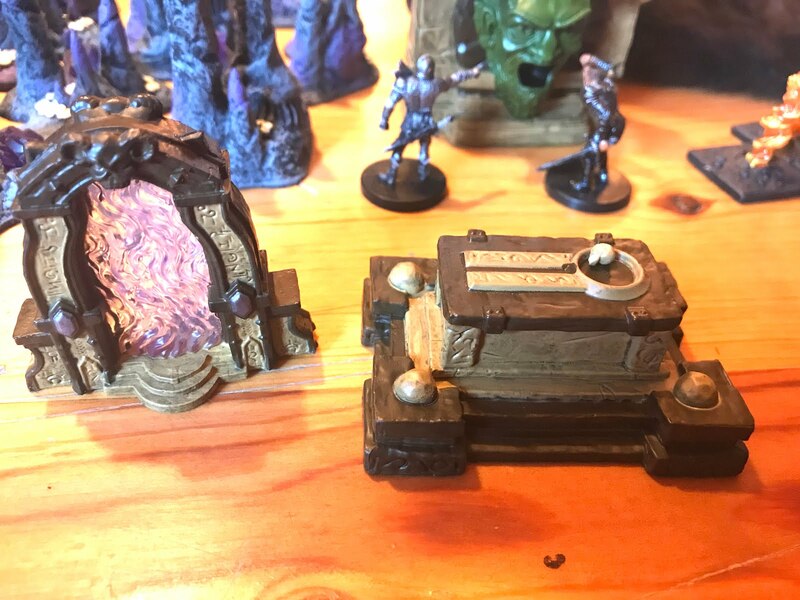 The sarcophagus of Acererak and the portal are both solid and well made, but like the spike pit, the sarcophagus is somewhat lacking in detail, and could sue a nice brownish-black wash to bring out the edge highlights and side-hyroglyphics. The other small details, and I do mean SMALL, are outstanding but it will take an extremely well-organized Dungeon Master to keep track of these items including the four potion bottles, the sword, shield, scrolls, and skull of Acererak. The details and clever design for bringing the campaign to life are incredible, but even as organized and meticulous as I am over my D&D mini collection, I worry about losing these before they get any tabletop time. 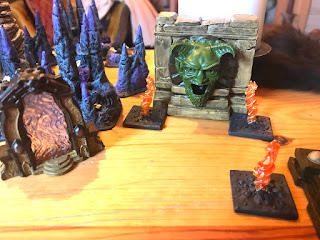 All in all this is an outstanding set by Wizards of the Coast, and brings to life both vintage-styled nostalgia and modular usability for great dungeon terrain! This will surely be featured in some of creative Dungeoneerings upcoming Game Tales. THE CRATER PLAIN BATTLE BOARD! Deep within the bowels of the Creative Dungeoneering catacombs, in the icy depths of the lost north & away from the prying eyes of other terrain creators, gamers, and adventuring parties, the Polar Bear horde crafts away with foam and glue and paint to create the next generation in modular terrain...the Creative Dungeoneering Crater Plain Battle Board! While similar in design (and construction) to our previously designed modular gaming battle board, the Crater Plain version we created here is quite a bit larger. A larger board is not necessarily always a better board however. And often times it can present too much terrain and distance between armies for initial set-up. When being used for war-game play (such as in Warhammer 40K), timing can be slow, and take hours for rounds to complete. This is less of an issue when being utilized for role-playing terrain, and serves well for adding large scale modular additions such as mountains, cavern accents, and hills and mounds. The goal of the Crater Plains board is to provide a few notable and useable features for Sci-fi table top wargaming or role-playing, or serve as a basis for additional role-playing/fantasy use. But it's crucial feature its both its size and its emptiness, or its lack of features! Space-as in empty space, left bare, flat, or without additional features serves well to a dd additional features on top of, so this board needed an ample amount of surface area from which to build future expansions, thus ensuring it was truly modular. The main features of the base of the board other than the stone textured finish are it's 4 main craters. I started this board in our standard secret black foam core (1/4" thick paper-backed foam core or 'gator board' often used in the advertising and design industry) and carved the craters into the foam but not through the paper on the underside. 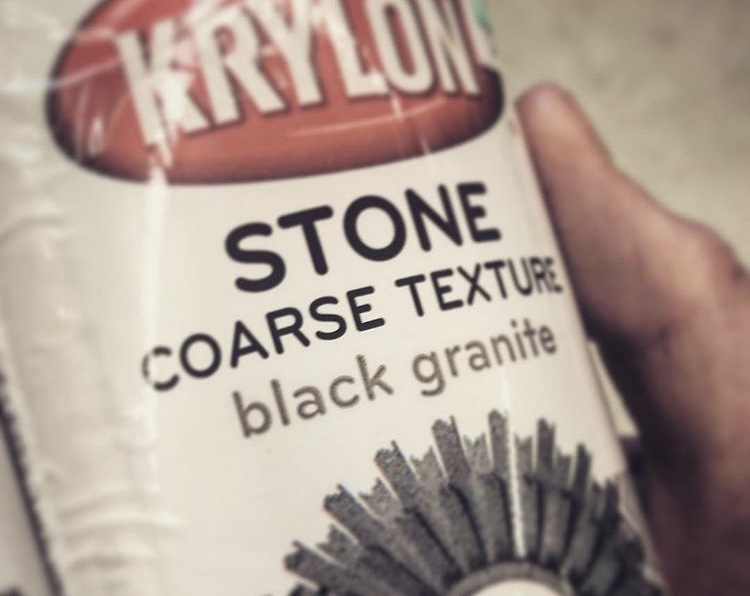 After this was completed, lightly sanded and smoothed out, the entire board was coated in two full cans, evenly and SLOWLY sprayed over the entire surface, using Krylon brand Stone texture paint in Coarse Texture Black Granite. The 'Black Granite' is really more of a gray and white speckle, but works well given the foam core itself is black. But for a board of this size it did in fact take two full cans-not the cheapest method, but the best long-term. The key with texture paint is two factors: Warmth and Wind. 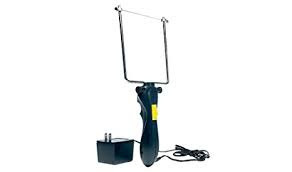 Try to use it in a warm (or room temperature) location if possible, not outside in the cold. And NOT in wind. Any! Not even a slight breeze. This means indoor use is the best but the smell of this can be quite pungent, so just the right conditions for a space this big is crucial. Once sprayed and dry, the small-detail edge painting began. And this is where Fantasy Geology comes in. 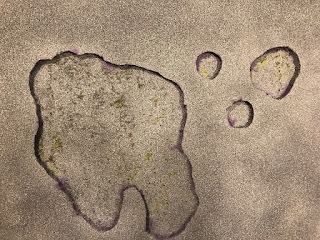 Because I wanted the craters to look real and like they had some actual purposeful growth or algae forming from within, I paid close attention to the cracks and crevices on which paint was applied. 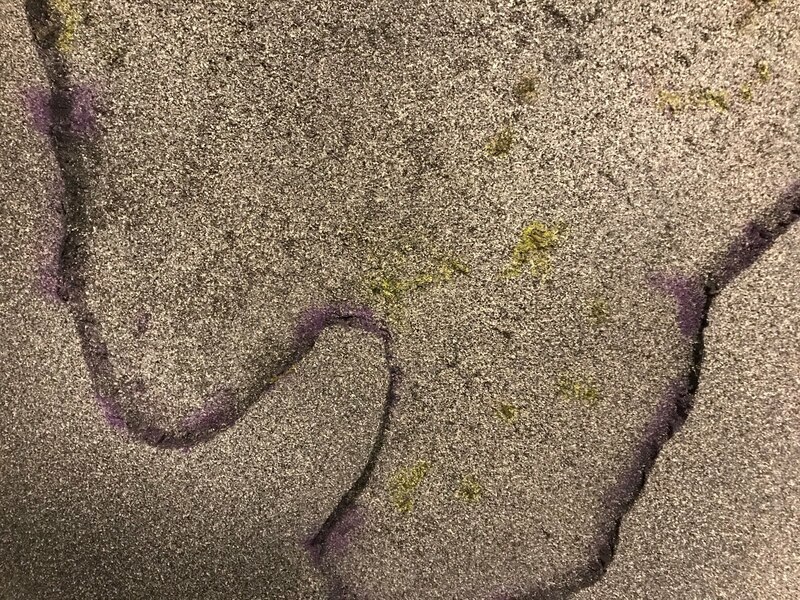 Only placing small dabs of dry-brushed toxic green over raised surfaces like a growing alien or deep cavern mold of some unknown variety. 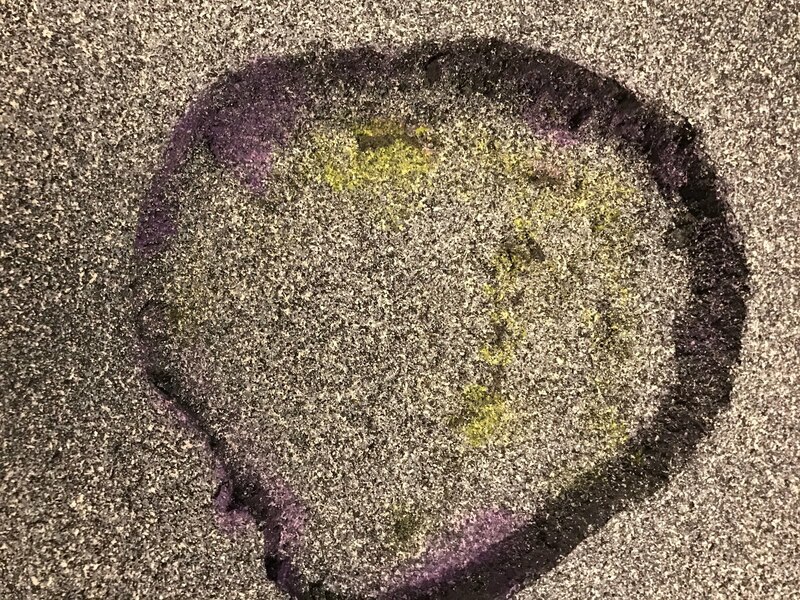 For the purplish hue on the edges, this was applied using a dry brush technique of dabbing an old brush lightly into a deep purple acrylic craft paint, removing excess on the pallet, and then in a swift dabbing, semi-rough maneuver, allowing just a tiny bit of paint to settle into the stone surface texture along raised edges of the craters and where cracks formed onto the surface. 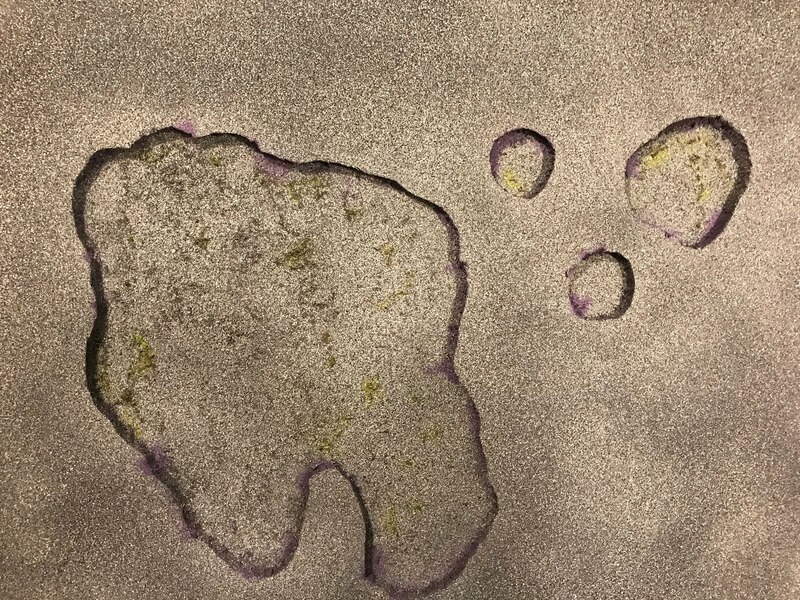 This gives the look of an alien growth or crystalized algae of some form creeping over the lip of the crater and through the small cracks to the surface. For final preparation I may be adding a dab of gloss varnish to these areas to give the looks of natural crystals, but keeping this board minimal in its design, allows for multiple uses and potential areas and genres it could be used. 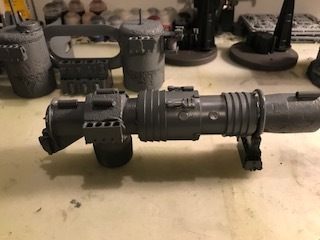 The priming continued this weekend with the completion of a whole gaggle of Sci-Fi Terrain. Finished painted pieces may appear at a later date, but primarily for now this will detail individual ideas and inspiration for construction. The names are completely arbitrary of course, but I tend to go for a slightly less "doom and gloom" view of the Warhammer world. Think more "Warhammer meets Star Wars" so much like the lines and accessories here, I try to allow the terrain to take on a slightly more clean look too. Find items that look like they have a purpose in the Universe for which you are creating-regardless if your entirely sure what they are or even how they work. 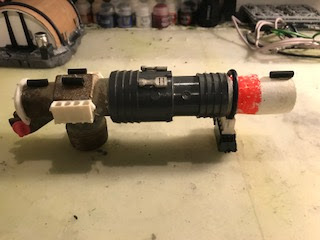 This was assembled with standard white pva glue, and comprised of a bar-end cap from a set of roof top Yakima brand bike rack bars, the stub of a space marine torso from an old Rhino tank, two white plastic coffee straws, and a few random plastic bits torn from an old circuit board (see last post on Sci-Fi terrain). The real key here was the varying level of the straws serving as 'antenna' that give the piece a functional look. The small coil on the side is actually a roll of copper wire from the circuit board, so this should add a nice touch of realistic metal once completed. 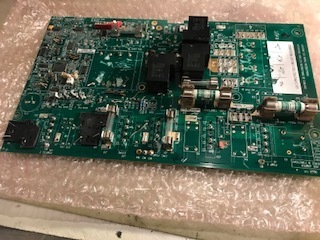 Beacons, industrial tubing, old spacecraft parts...whatever your imagination comes up with. 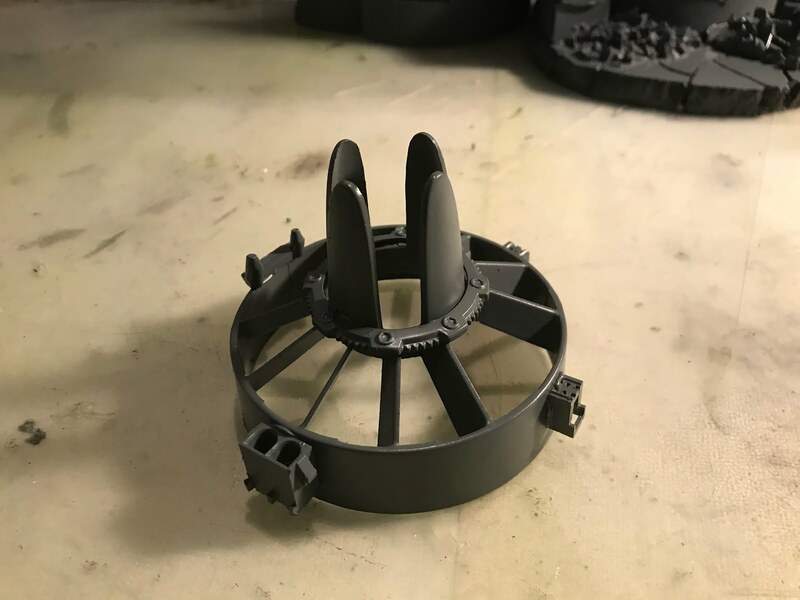 But when you prime sprinkler parts, and what I think was some form of 'juicer piece' the results are something right out of the 41st millennium. The beacon to the left was made with a sprinkler part from a local hardware store glued atop a small led tea light. Tinfoil was placed inside to reflect the light and give it a slight flickering glow like fire. 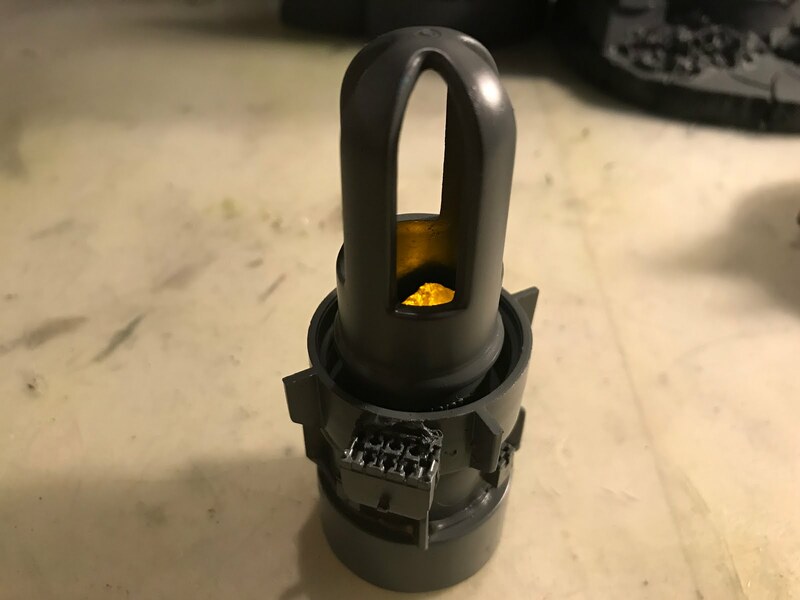 This bottom piece is some previously saved and currently un-remembered piece of unknown plastic, but with one odd catch: It's either REALLY expensive, or...not. the ring around the spires is the metal watch face lock ring to a TAG Heuer watch. yes, THAT TAG Heuer. But since I purchased this off the street in Jakarta Indonesia from some shoeless kid on a broken down scooter, I can't say if it's real or not. I can say that when I took it to a jeweler a while back they wanted to charge me $75 for the battery, so rather than divulge that I paid 41,253.00 (Indonesian Rupiah, so like $3 US), I kept it. Does that mean it's real? Who knows. After he got my three bills he was off on his "previously claimed to be broken" scooter faster than lightning. Good story...mediocre watch. But it makes great war game terrain! 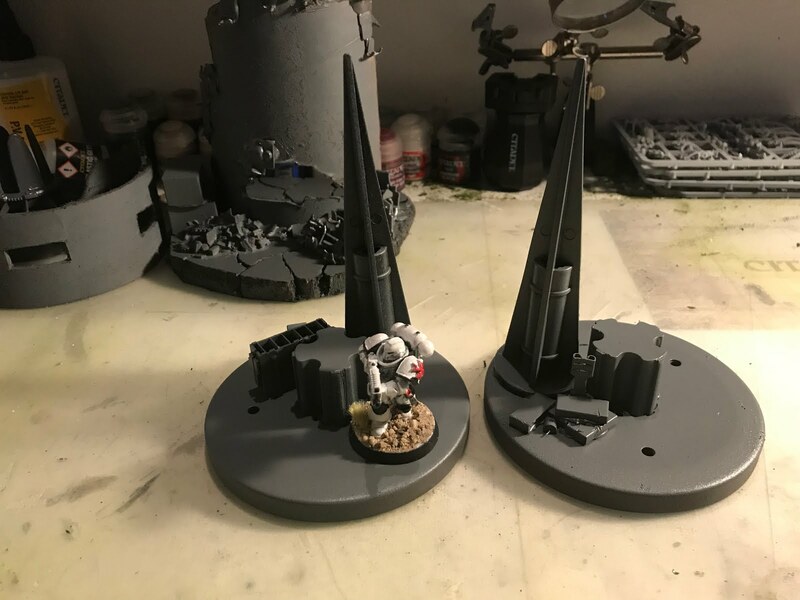 These are similar to the Planetary Beacon above in that I have no idea where they came from, but they made excellent terrain. 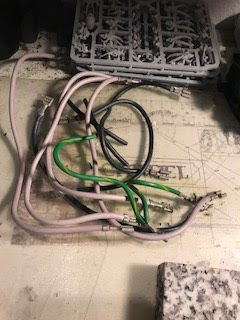 Parts for the stockpiles of materials being waited for transport are random bits from the electrical motherboard I pulled small "greebles" from previously. The cones and base are odd plastic affairs with no remembered identity. 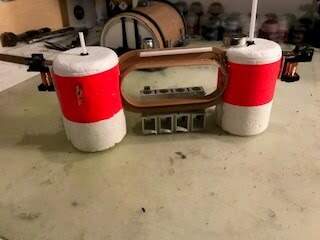 This is constructed from a cardboard tube cut in half and fixed with wires and a small Warhammer tank hatch from a previously unused section of Rhino. The base to which this is fixed is a thick foam-core used in advertising signage, but any reinforced cardboard or foam core will work. 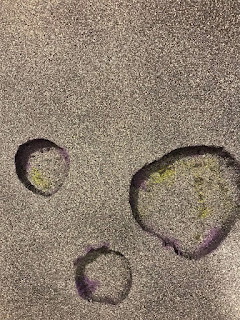 The advantage of the foam base is the ability to not only "sink" accents into the ground, but also to give the ground a surface of it's own. 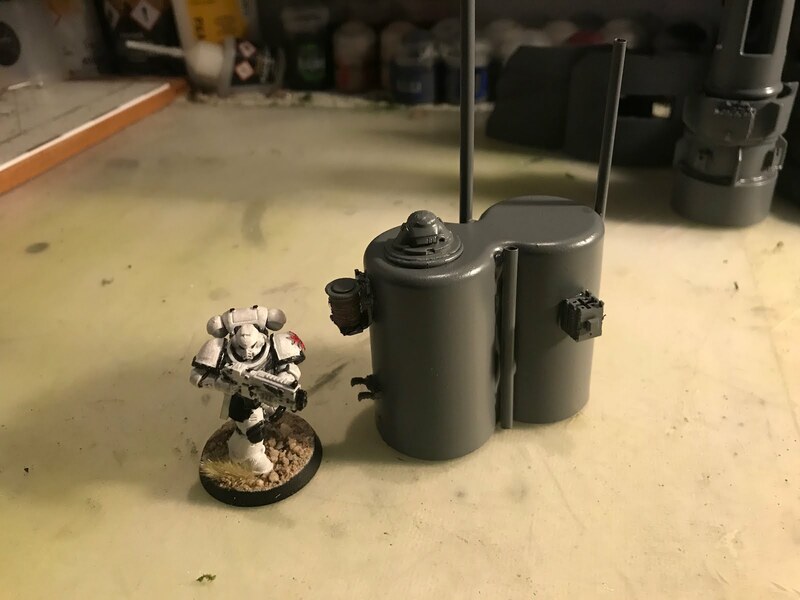 The tanks to the right of the entrance is actually a small cell battery, primed and inverted. 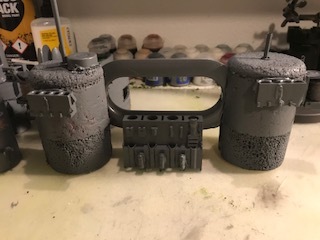 The other half of the cardboard tube that was used for the Command Bunker above was utilized to make ruined tower and the small guard walls. 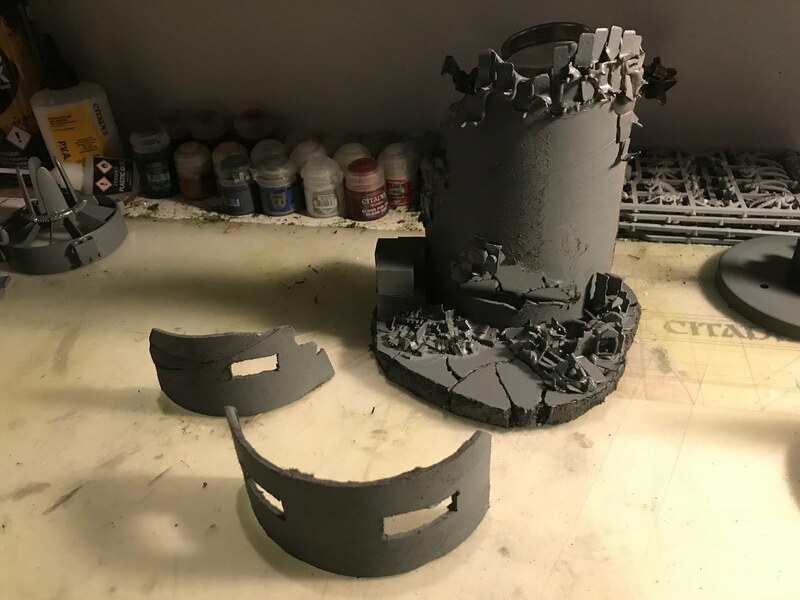 Additional metal greebles and electrical parts were stacked on top of a foam core base along with various small parts and random bits to give the look of a dilapidated and crumbling tower. Notice here how primer was laid on extra thick. This was done on purpose to allow the paint to seep in and cover the metal. It needed to be thick to cover the visibility of the pieces being modern (or mundane), but it would also allow for some variance as this will primarily be dirt, dust, rubble, and old foliage. 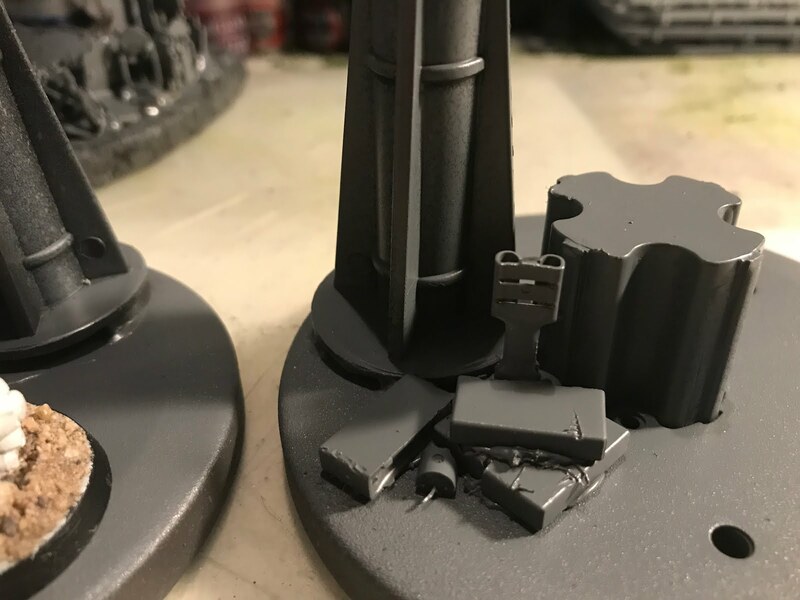 Additionally, those gaps where the paint is at its thickest will be filled in with pieces from the Citadel Skulls collection - highly recommended for a adding some dark battlefield doom to your terrain. 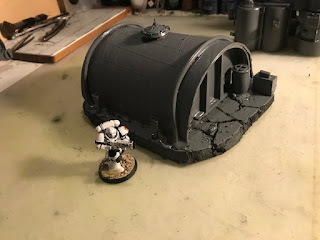 Sci-fi terrain (Star Wars, Warhammer 40K) is TOUGH! But not angles, lines, boxes, widgets, buttons, and "greebles" as I've heard them called before (small accents that look like they have a function but in reality, do not). So in creating Sci-Fi terrain for Warhammer 40K and Star Wars RPG use (although I do not currently play SW RPG, but would someday love to...), I found it tough to make the mental switch from one genre to the next. I needed help. a computer. Or maybe just a broken jacuzzi motherboard. This turned out to be just the inspiration I needed. I had no problem coming up with "shells" that looked like they had "futuristic potential," but it is the small fine details that made the difference. 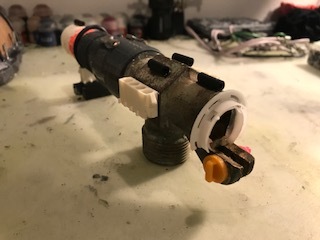 And this old leftover piece from replacing a jacuzzi spa heating system was perfect. Wires were used throughout as well, cut and shaped, and even the ends made for interesting lines and edges to give each part character. This was made from a heavy base of actual brass pipe, with various small parts scavenged from sprinkler repair. 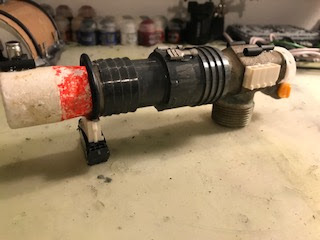 I added the white plastic ring at back (the inner workings of a fake (I hope) TAG Huer wristwatch (purchased for $3 USD on some Bangkok street corner), a small wrap of wiring on the front, and a nozzle from a foam fishing bobber cone, inverted and screwed into the plastic gray pipe. Bits were added to the top from cut wire ends, small beads, and even a few plastic bracelet pieces from my daughters nightmarish craft horde. 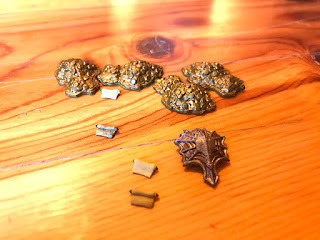 Small white side pieces and base bits were ripped from the circuit board, all of which I am far to dumb to identify...but they look great when primed. Edges, small holes, squared lines, and architectural structure that implies meaning or purpose beyond the need to understand. This one turned out as the biggest surprise thus far. I threw this together with extra parts thinking I'd just see how it turned out, and it's ended up being one of my favorite. 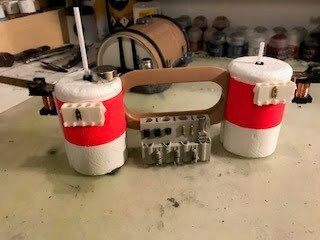 I started with two round foam fishing bobbers, and inserted simple coffee straws as antenna into the top, giving each a different height for some visual depth and detail. I then fixed a small brown ring handle from an old cardboard shipping box in between the two, cutting a slit into each foam side, and creating a form of "window" or control screen. 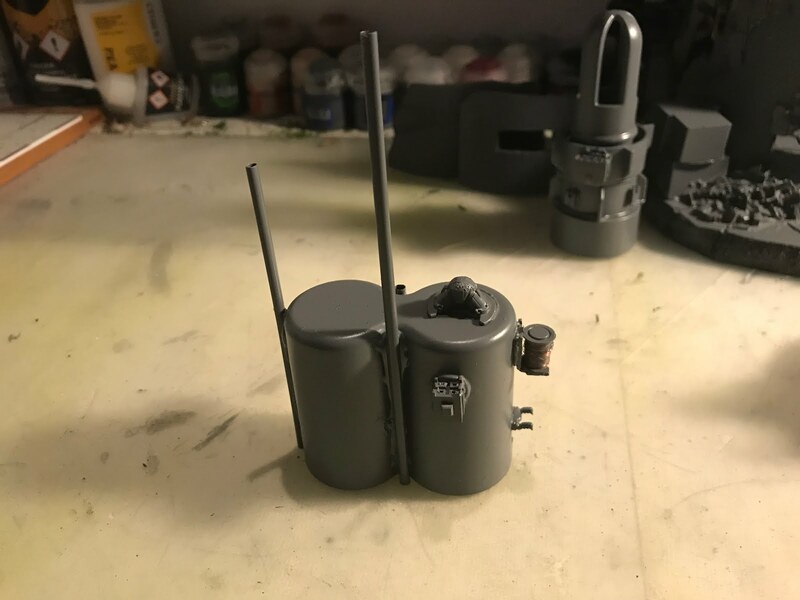 Once I added the small circuit pieces and battery parts to the top, sides, and front panel of the base, it started to take on a very 'functional' look, as if each piece has a purpose, we just are not entirely sure what it is. Thats the essence of a good greeble I think. When primed, the foam takes on a slightly pitted look, giving it the finish of old plaster, sandstone, or stucco. 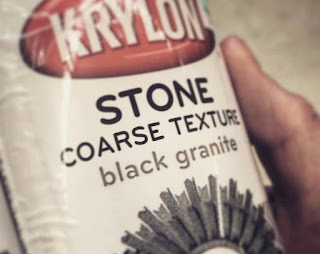 Perfect for a desert or deteriorating structure on some far away world. 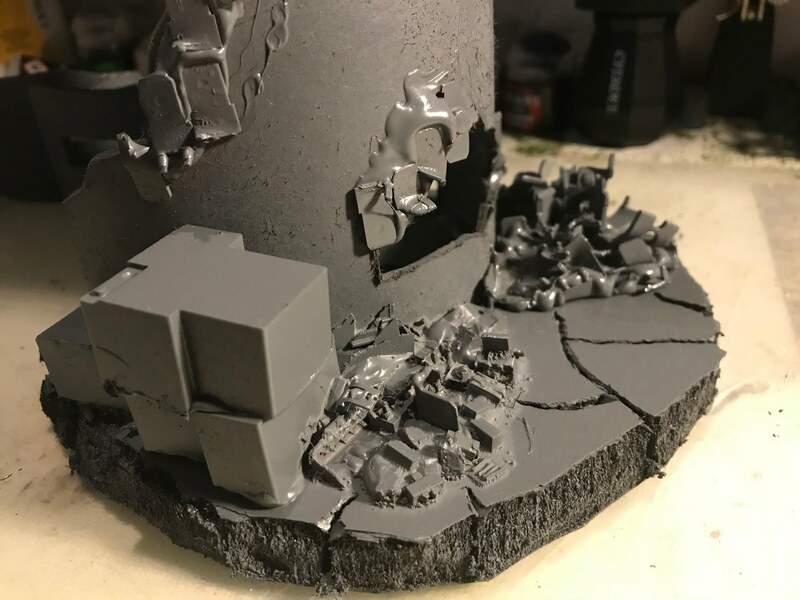 Trooper Outpost, Planetary Beacon, Carbon turbines, and Ruined Tower and Scrap Heap. I do a lot of solo RPG gaming. Mostly because I haven't found a group consistent and committed enough in my immediate area for any form of regular play. And so I build a lot of terrain for that specifically, that can be used modularly to help generate a better idea of the imaginative world in which I am playing the game. 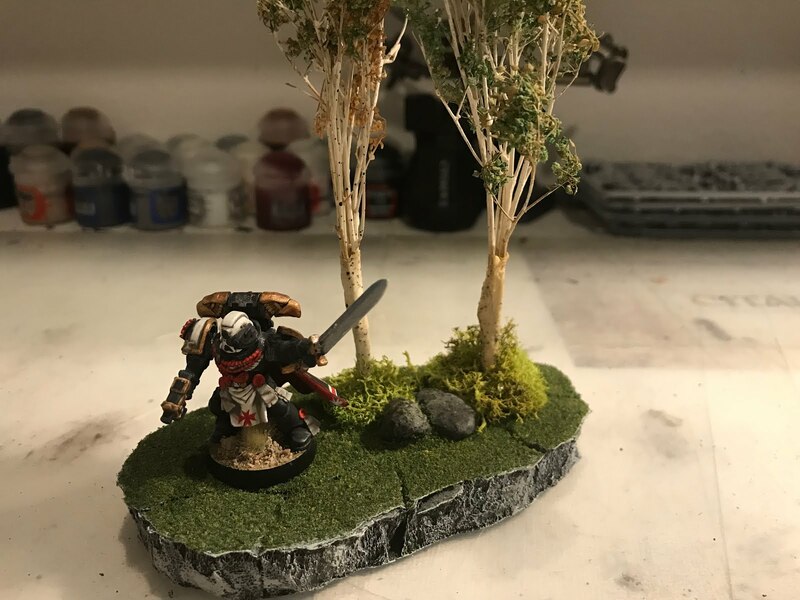 Of all the terrain I make, trees are by far my favorite. I never feel as if I can have too many. Sometimes a small encounter is perfect though, and for that, a bit of extra foliage and even just a small scene-scape can be ideal. Not only can it add to a greater forest diversity when used in with larger terrain, but on it's own it stands as a unique scene. For this use I created a small scene with only two small aspen trees, a small base, and a few natural stone accents with surrounding foliage. I started with two strands of small wires, and banded these together with simple electrical tape. From the tops of that I added actual wood strands in smalls tick like branches, gluing each individual stick onto another to get just the right natural look. Once I had the sticks 'bound' together and the basic tree form assembled, I added more masking tape, winding it up and around the trunks before adding a cream-white colored paint (rather thick) to the masking tape itself, allowing the lines of the masking tape to show through just a bit to give the look of bark and natural wood grain. This was followed with a charcoal colored paint dabbed in varying sizes to give the aspen-like illusion of knots and divers in the natural wood-the 'spots' look. A very light dry-brushing of a softer tan over putter edges of the branches mirrored well the changing look of the flocking added to the tree tops too. Instead of going with completely green as I have done in the past, I added in flecks of lighter almost, burnt, coloring to give the look of changing leaves, or maybe a bit of natural tree fungus, disease, parasite, etc. The base was made with my go-to material: thick foam-core in black with paper-backed edging (called Gator board in the Design/Advertising world), and carved first with a simple hobby knife for texture and stone, then flocked with a mixture of green foliage made from a combination of pencil shavings, standard pva glue, green paint, and light bits of green food coloring. 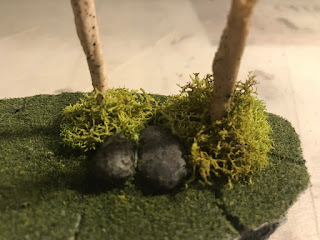 Applied over a thin layer of painted-on pva glue and allowed to dry before drilling the tree holes allows the flocking to run right up to the base of each tree trunk. 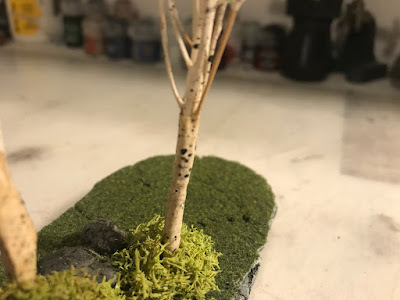 Finally, I added a few small natural stone accents (to give the base weight0 and surrounded the tree trunks with standard hobby-shop floral lichen. 1: A darker, deep gray in vertical strokes only. 2: A lighter stone gray in sideways lightly applied strokes, allowing both the black of the foam core and the gray of the previous layer to show through ever-so-slightly. 3: a dry brushed layer of light, almost white-gray over the top giving highlights of natural granite. The result is a small little grove, single forested encounter piece, or modular tree stand for use alone or in conjunction with additional tree pieces. As Cavalier Elrik once said, "There are more trees in Flannessia than tears. Pray it will always be so."